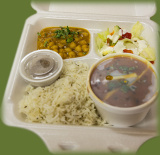 Masala Corner Authentic Indian Cuisine Restaurant in Hamilton Ontario nearby McMaster University -take away, catering, delivery. -Veg./Non Veg -Vegan Menu -Gluten Free Menu. Dear customer, please take a moment to review us. Tell us how we are doing. Your feedback is greatly appreciated. Coming Soon! Please check back in the near future. Thank you kindly to all our customers. It was a pleasure and we look forward to serving you again. Newly opened by Main St W & Longwood/Paradise Rd N just accross the Pizza Pizza and nearby McMaster University. Offering a large variety of Gluten free, Dairy free and Vegan Items. Tell us your chilli spice preferences -special order Hot, Medium or Mild dishes.